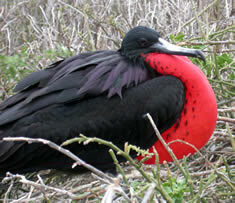 72 Bird Species recorded Galapagos - all endemics! Everyone met at London's Heathrow airport for the flight to Quito, Ecuador and the start of what turned out to be an absolutely fantastic tour to the magical Galapagos Islands. An uneventful flight was followed by a punctual arrival in Quito, where a chaotic and prolonged immigration and baggage reclaim, eventually resulted with Nick and Juan meeting the group in the arrivals hall. With an 8am flight to the Galapagos, after some brief introductions, we were soon on our way on the internal flight. A brief stop in Guayaquil punctuated the journey, before arriving in Baltra on the Galapagos Islands. A short bus ride took us to the harbour where we were ferried to our ship, the `San Jose' in two inflatable zodiacs. The setting was very picturesque, with a clear blue sky greeting our arrival, and around the harbour we saw Great and Magnificent Frigatebirds, Common Noddy, BrownPelican, and some distant Nazca Boobies. Our Galapagos naturalist, Billy, gave us an introductory talk about the islands, and we got settled into our new surroundings and home for the next nine nights. Eventually everyone met on deck, and further scanning revealed an American Oystercatcher on a nearby beach, whilst out to sea several huge Manta Rays were seen breaching, and there were also lots of Audubon's Shearwaters watched flying across the bay. As we sailed towards Bartolome, both Elliot's and Wedge-rumped Storm Petrels followed in our wake and we had ample opportunity to compare plumage and structural features. With quite a few Red-billed Tropicbirds being seen, and closer Nazca Boobies, our full attention was directed to seawatching. The first of 5 Dark-rumped Petrels was seen quite close to the boat, whilst a few parties of Red-necked Phalaropes flew by. On arrival at Bartolome we donned lifejackets, and the zodiacs took us close to the rocky shoreline where several Galapagos Penguins stood totally unconcerned by our close proximity. This was to be the first of many truly exhilarating wildlife experiences on the Galapagos, where we never failed to be in awe of just how tame the animals were here. From here it took just a few minutes to get across the bay for a walk up to the viewpoint. A Galapagos Green Turtle appeared next to the boats on our approach to the landing site, whilst a couple Galapagos Sealions greeted our arrival. With Wandering Tattler and AmericanOystercatchers on the rocks allowing us some good views through the scope, and a GalapagosHawk overhead we started our ascent. The boardwalk made life easy as we walked above the lava dust, enjoying superb views out across the islands. Even here on this volcanic and rather barren island, we still managed views of Galapagos Dove and Small Ground Finch. But with the light fading fast, we returned to the `San Jose' for a welcome cocktail and a chance to meet the whole crew. We awoke to totally new surroundings this morning, with the nearby cliffs of Genovesa covered in seabirds. Both Magnificent and Great Frigatebirds soared by, with quite a few Red-footed Boobies of both white and brown colour phases being seen. Closer to the water, on rocks at the bottom of the cliffs, immaculate Swallow-tailed Gulls could be seen perched. When they took flight, their true splendour could be seen, and they must surely rank as one of the most elegant gulls in the world. Slightly more distant across the bay, several Red-billed Tropicbirds could be seen whilst a little closer at hand, Mick saw a Lava Gull perched on our ship! A Galapagos Green Turtle swam very near, whilst several large fish could be seen below the clear waters. After a fine breakfast, we boarded the zodiacs and went the short distance over to the beach. What we were confronted with upon landing will live with us all forever, as it was like walking right into a television documentary. There was a Galapagos Sealion suckling its pup on the beach, whilst littered on the rocks and within inches of the path were numerous Swallow-tailed Gulls. As with all the wildlife encountered today, you could have literally reached out and touched the animals if you so desired. The bushes all around were covered with nesting Red-footed Boobies, Magnificent and Great Frigatebirds, with Nazca Boobies on the ground. Further scrutiny revealed our first Sharp-beaked Ground Finches, whilst Mangrove Warblers were even more obliging. The path followed over rocks, and at one point a Yellow-crowned Night Heron held up our walk as it decided to block the path. On the beach Spotted Sandpiper and Hudsonian Whimbrel were found, whilst a couple Wandering Tattlers showed briefly on the rocks near the water's edge. Both Large Ground Finch and Warbler Finch were seen very well during our quest for one special bird in particular. Our search for Large Cactus Finch got off to a great start with one individual being seen quite easily, but unfortunately some of the group had been lagging behind and missed it. We had another brief sighting but that was it for quite a while, and had all but given up when Juan found a close bird which everyone managed to see very well. With more boobies and frigatebirds to distract us, we eventually arrived at the beach again, and most of the group tried a short snorkelling session. The undoubted highlight was our close encounter with two White-tipped Reef Sharks who were resting in a small cave. We managed to get very close to them, and they seemed oblivious to our presence. Many other brightly coloured fish were seen including Parrot Fish, Trigger Fish, and Surgeon Fish. What an experience! Back on board we were treated to an incredible aerial display by the Red-billed Tropicbirds, who chased each other overhead. After lunch we went over to Prince Phillip's Steps, where more close encounters followed. This time we watched adult Nazca Boobies tending to their very small chicks, more close Red-footed Boobies, Galapagos Mockingbirds were very inquisitive, and the Wedge-rumped Storm Petrel colony was very impressive, with birds flying all around us. So in the late afternoon we left Genovesa, and headed towards Isabella. With just under two hours daylight we scanned the sea for any signs of life. What a time we had, with a Hammerhead Shark showing right next to the ship to start the ball rolling. Some time later a whale could be seen blowing, and there appeared to be several present. At first we were only getting glimpses of the animals, but when two came within 50 yards of the ship we were treated to fabulous views and were able to identify them as Bryde's Whales. A short while later, our first Madeiran StormPetrel appeared in front of us, and we were able to note all salient i.d features. Another was seen just before the light went completely, to round off a truly amazing day. We were still quite a way from Isabela by daybreak, so most of us took the opportunity for more seawatching. As we approached the northern tip of Isabela, several more Dark-rumped Petrels were seen. Their characteristic long wings, distinct flight action and pale face all seen well. With Elliot's and Wedge-rumped Storm Petrels always in view, we had plenty to keep us occupied. Amazingly, another close encounter with a Bryde's Whale next to the boat was totally unexpected, whilst an unidentified shark's fin was seen, as well as the long, thin tail of a Marlin. Soon after breakfast we went ashore on Black Beach, disturbing a host of Ghost Crabs in the process, whilst the Galapagos Sealions were equally unperturbed. Stopping quietly by the mangroves we waited patiently and after a few minutes a Mangrove Finch appeared right next to us. It was good to compare the bill shape and structure next to the Small and Medium Ground Finches also present. Walking along the shore, a huge Marine Iguana looked disdainfully at us as we took photos of him. Another patch of mangroves was tried, and we were rewarded with prolonged views of a full adult Mangrove Finch. It was an unbelievable opportunity to study this incredibly rare bird. So, more than satisfied with our excursion we returned to the `San Jose' and sailed for just under an hour to Espinoza Point on Fernandina. Walking along the shore, we were soon watching FlightlessCormorants from very close range. A couple pairs had young, whilst a large egg was just about visible under another bird. A Galapagos Hawk perched nearby, whilst Lava Heron, BrownNoddy, Wandering Tattler and Galapagos Mockingbird were also seen. With gangs of Marine Iguanas to keep us entertained we reluctantly returned to the ship and set off on the long journey towards Santa Cruz. We brought our tally of Dark-rumped Petrels up to 30 before dusk, whilst a few Red-neckedPhalaropes were also seen. One interesting behavioural action was observed when a GreatFrigatebird attacked a passing Blue-footed Booby, causing it to regurgitate its food. As we were watching this a huge Waved Albatross flew in and helped itself to the pickings! This was a behaviour observed on several occasions this afternoon, and up to 10 more huge albatross were seen, majestically soaring above the rough seas. A beautiful sunrise found us well out to sea, sailing towards Santa Cruz. Further seawatching produced from 5.45am, impressive counts of 340 phalarope sp, distant views and most likely to be Red-necked, 69 Dark-rumped Petrels, 4 Red-billed Tropicbirds, Swallow-tailed Gull, and smaller counts of usual seabirds, include Elliot's and Wedge-rumped Storm Petrels, Blue-footed and Nazca Boobies, Common Noddies, both frigatebirds, while Audubon's Shearwaters remained surprisingly scarce with only eight noted. On arrival in Puerto Ayora everyone went ashore and visited the Charles Darwin Research Centre, where a Common Cactus Finch gave itself up very easily. A short tour then followed, where we learned about the conservation of the Galapagos Giant Tortoise. After lunch a bus took us up into the highlands, where the scenery changed dramatically. A muddy unpaved road took us up through dense woodland, where Short-eared Owl and Dark-billed Cuckoo were both seen from the bus. Thick mist and drizzle greeted us on leaving the bus, and after a short walk uphill, amongst the stunted trees and ferns, the ever elusive Galapagos Rail showed remarkably well literally four feet away from us. Walking downhill back through the forest produced a stunning male Vermilion Flycatcher, as well as a Woodpecker Finch at a nest high up in the canopy, and both Large Tree Finch and Vegetarian Finch. That evening, several of the group visited a karaoke bar in the town where many famous songs were `destroyed'. But it was probably Lee and Martin's stint of `air guitar' that stole the show! This morning we went by bus to a wooded area interspersed with farmland. It took about 40 minutes as we drove up into the highlands, and after some wellington boots were hired, it was not long before we were looking at a pair of Small Tree Finches. Further down the road several Smooth-billed Anis were present, and proved to be extremely common here, whilst a brief Dark-billed Cuckoo was also seen. The walk down to the lake produced several Galapagos GiantTortoises, and an all too brief Paint-billed Crake, whilst in the trees all around Woodpecker Finches could either be seen well or heard calling. On the lake, White-cheeked Pintails, Common Moorhens, and 5 American Purple Gallinules were all new for the trip. Several Magnificent frigatebirds flew down to drink the fresh water, giving a fantastic aerial display, and another brief encounter followed with the elusive Paint-billed Crake, whilst Large Tree Finch and Galapagos Flycatcher were both much more obliging. From here we drove back uphill, with some of the group walking underground through the lava tunnel, whilst the rest of us consumed our picnic lunches at the hacienda, complete with cold beers. More Smooth-billed Anis were seen, as well as Monarch and Queen Butterflies. Once everyone had finished their picnic lunches, a short drive took us up further into the highlands, where we could view two huge craters, where Small and Medium Ground Finches, and Galapagos Doves showed very well. By 2.30 we had returned to Puerto Ayora, giving everyone the chance to partake in a little souvenir shopping. Birds seen around the rocky shoreline of the harbour by the non-shopaholics amongst us included Lava Gull, Mangrove Warbler, Striated and Great Blue Herons, Semipalmated Plover and Wandering Tattler. Unfortunately, the karaoke bar was revisited this evening - say no more! After breakfast the zodiacs took us over towards Black Turtle Cove, on the other side of Santa Cruz, where we cruised through the mangroves. It was very peaceful as we turned the engines off and paddled slowly, seeing two White-tipped Reef Sharks below us in the shallow waters. It took a little time to find anything else below the surface as the tide was high reducing visibility, but Billy knew where to find the clearer water, and with a little patience we were treated to a wonderful array of wildlife sightings. A couple Black-tipped Reef Sharks were seen, as well as a few Galapagos Green Turtles, followed by a group of Golden Rays. Along the edges of the mangroves we saw Common Sting Ray, White-spotted Eagle Ray, and a Diamond Sting Ray. Birds present included Great Blue and Striated Herons, and a Brown Pelican perched in the trees. Returning to our ship, we then sailed to North Seymour, seeing a couple more Hammerhead Sharks, and with further close views of Red-billed Tropicbirds. After mooring, we had lunch followed by a siesta, before snorkelling below the cliffs. What an experience as we swam with a couple inquisitive Galapagos Sealions, and had another encounter with a White-tipped Reef Shark, whilst a huge Marbled Sting Ray `flew' along through the clear water. Many more beautiful fish were seen amongst the huge shoals of Sardines and Anchovies, including the brightly coloured King Angel Fish, Cardinal, Puffer, Parrot and Surgeon. Meanwhile many groups of Audubon's Shearwaters flew low over our heads along the cliff face. Afterwards we headed over to North Seymour where several Land Iguanas were observed. Large numbers of Magnificent and Great Frigatebirds were nesting right next to the path, with males seen displaying with their bright red throat sacs. Blue-footed Boobies were also present, some juveniles still retaining their downy feathers. As evening drew in, adults were seen bringing food to them, with some being hassled by the frigatebirds in regurgitating their catch. A Galapagos Racer Snake was seen, as well as Sanderling and a distant Dark-rumped Petrel. It was a great photo opportunity for everyone, as once again the birds were right next to the path, including several more Blue-footed Boobies, and in several instances you had to literally step over them! Meanwhile Galapagos Sealions with cubs were lying on the path, whilst Swallow-tailed Gulls were as approachable as ever. We arrived at South Plaza at 5.45am with a few Kelp Gulls being noted by the early risers. After breakfast we had a dry landing on the island and were greeted by a couple Land Iguanas and a confiding Common Cactus Finch. Walking along the trail to the top of the cliffs, we were greeted by a panoramic view, complete with hundreds of Audubon's Shearwaters flying below us, and at eye level, with large rafts of them sat on the sea. Also here we had superb eye-level views of several Red-billed Tropicbirds, with one individual also seen in a narrow crevice on the cliff face. We lingered here for quite a while, and it was very refreshing in the strong wind! Continuing on, a pair of Kelp Gulls was giving quite good views amongst the rocks in the middle of this small island, and even a House Mouse was found amongst the rocks! Then, we sailed for three hours to Santa Fe, and moored in a scenic looking natural bay where in the perfect clear waters a couple Hawksbill Turtles were seen. After lunch, some of the group had another short snorkelling session, whilst the others had a siesta. With a close Marbled Stingray, more close Galapagos Sealions and plenty of fish, it was a very successful excursion. Once everyone had assembled, we went over to the island, seeing the endemic Santa Fe Land Iguana. Whilst looking at this, two Humpback Whales were seen `blowing' offshore and they gave good views, even showing the barnacles on the head. With GalapagosHawks, plenty of very close Galapagos Mockingbirds to keep us company, and more Galapagos Sealions, we returned to the ship ready for dinner. We went ashore to Floreana this morning, and travelled in a vehicle of indeterminate make or design up to a specific elevation in search of our last Darwin's finch. It didn't take very long at all to find a Medium Tree Finch which showed very well right next to the road. Once everyone was satisfied with the views, we drove back downhill, seeing Smooth-billed Ani, and lots of Small and Medium Ground-Finches. In the small harbour a brightly coloured Marine Iguana was well photographed. The `San Jose' took us round to Cormorant Point, where the journey was enlivened by a pod of 75+ Bottle-nosed Dolphins that took to bow riding, giving incredibly close views as we watched right from the front of the ship. Once ashore, we scrutinised a large saline lagoon seeing quite a few Greater Flamingos, Black-necked Stilts, and White-cheekedPintails. Further scrutiny revealed at least 5 Semipalmated Sandpipers, a Spotted Sandpiper, Semipalmated Plover, and five Wilson's Phalaropes. Following the trail over to the beach we had good views of Least and Semipalmated Sandpipers together on an island in the lagoon, whilst on the beach a Grey Plover showed well. Our principal activity here was to wade out into the surf where many Common Stingrays could be seen at quite close quarters. From here we sailed round to Champion Island, where the Charles Mockingbird took three circles by the ship before giving itself up. 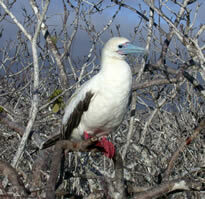 Plenty of Red-billed Tropicbirds were seen here, as well as Swallow-tailedGulls, and the usual Blue-footed Boobies. A distant pod of Bottle-nosed Dolphins was also seen here, and frustratingly as we were looking for the mockingbird, a small whale was `blowing', but unfortunately had disappeared by the time we had seen the mockingbird. Then we set sail towards Espanola, and most of the group settled down for another stint of seawatching. No doubt rather cynical at my insistence that we were entering very good waters for `something interesting'! Things started well, with nine Dark-rumped Petrels, and up to six Waved Albatross, including four together in fading light. Another pod of Bottle-nosed Dolphins joined us for a spot of bow riding, but activity seemed to dwindle, so all but a few hardy souls were left. The undoubted highlight for the lucky few was a very close Markham's Storm Petrel that flew across in front of the ship before continuing down the port side. Wow! to the path, and it was a privilege to witness their bizarre courtship and territorial displays. As we sat along the path, these huge, majestic seabirds were totally oblivious to our presence. After watching the famous blow-hole and taking a group photo, we followed the path back to the beach, with Galapagos Hawk and LargeCactus Finch for company. When we were all assembled on the beach, our one and only Galapagos Martin of the trip dutifully appeared overhead. From here we sailed to San Cristobel, seeing more Waved Albatross, as well as Dark-rumpedPetrel, four Arctic Terns, and two more Bryde's Whales. On arrival at San Cristobel, we took a bus inland and it didn't take long to find Chatham Mockingbird, our last endemic. Once again we had cleaned up! Also present during a short walk were Vegetarian Finch and Cattle Egret. With a little time left for shopping before dinner, a last wonderful meal on board ship and a farewell cocktail and speeches with the entire crew, some of the group returned to the town later in the evening to sample the local night life. After breakfast we said our goodbyes to the crew who had been superb throughout the tour, and went over to the Interptation Centre, where we learned a little of the history of the island. Our plane left at 10.30am, and we were soon arriving in Quito amidst a really heavy hail shower. The drive to Septimo Paraiso went smoothly, with no birding stops due to the mist and cloud descending. On arrival at this excellent lodge, there was just about half an hour of daylight left, so we gathered outside and watched the feeders. What a culture shock followed, as nine species of hummingbird were present: Booted Racket-tail, Empress, Fawn-breasted and Green-crowned Brilliant, Purple-bibbed Whitetip, Brown Inca, Rufous-tailedHummingbird, Violet-tailed Sylph, and Andean Emerald. With Scaled Antpitta calling, and a vocal WattledGuan showing briefly, we were all really looking forward to the next few days. After an early breakfast we drove to a lower elevation at Pedro Vicente Maldonado. As soon as we left the coach, what was later described as total sensory overload confronted us. Birds were literally everywhere, and we just didn't know where to look first! Fortunately there were several quite open areas allowing us to scan a wide area, and enabled pretty easy viewing conditions. The first bird seen was a majestic Swallow-tailed Kite soaring over a nearby hill, and we soon picked up another bird which we managed to scope when it perched right on top of a hill. We quickly noticed that lots of birds were moving through the roadside trees quite close to us, with a Brown-capped Tyrannulet posing nicely, whilst Social Flycatcher, Variable Seedeater, Lemon-rumped, Silver-throated and Blue-necked Tanagers being very obvious and numerous. In the trees next to the coach we found Bananaquit, Buff-throated Saltator, Tropical Parula, Palm and Blue-grey Tanagers in quick succession. Whilst Juan got really excited when he saw a male Scarlet-breasted Dacnis, and most of the group managed reasonable views of this local speciality. By this time, probably an hour later, we were still stood next to the bus, having not walked more than a few paces and still the birds were coming thick and fast. A tiny Red-rumped Woodpecker was scoped, whilst Purple-crowned Fairy, Orange-bellied Euphonia, White-lined Tanager, Golden-faced Tyrannulet, Greenish Elaenia and a superb Green Thorntail all kept us ticking over nicely. A few Guira Tanagers showed up, just before a distant Choco Toucan was scoped as it called from the top of a tree. Whilst watching this, a Snowy-throated Kingbird appeared, before a cracking Black-cheeked Woodpecker and an even more impressive Yellow-tufted Dacnis was found. A Brown Wood Rail started calling close by, but try as we might, we never even got a glimpse of it. So we walked along the road just a few hundred yards, finding Pale-mandibled Aracari, Tropical Gnatcatcher, Thick-billed Euphonia, Sooty-headed Tyrannulet, Green Honeycreeper, and both Stripe-headed and Spotted Woodcreepers, which were all seen well. Then a fine Golden-hooded Tanager was seen by all, before a pair of Yellow-tailed Orioles posed nicely on some tree tops, and just before a Golden-olive Woodpecker was seen. Then a flurry of activity led us to a rather bold Western Slaty Antshrike and a pair of Dot-winged Antwrens in the same spot. With Red-headed Barbet, Black-and-White Becard, and a very inquisitive Black-headed Tody-Flycatcher all completing a rather mad twenty minute spell. We then drove a short way further along the road before taking a side track. The path went up the hillside before dropping down, and we were once again confronted with lots of new birds. In one spot we had a Dusky-capped Flycatcher, Wedge-billed Woodcreeper, One-coloured Becard, Purple-chested Hummingbird, and a shy and skulking White-bearded Manakin. Some movement in the canopy of a reasonably close tree led us to a small flock of Scarlet-rumped Caciques, whilst we eventually tracked down a calling Choco Trogon that gave great views. Retracing our steps, we took a different path and were fortunate to be able to look down on a feeding flock below us. With several Blue-necked and a Bay-headed Tanager feeding in a fruiting bush, it was no surprise to find more goodies, but what we didn't expect was the rare Rufous-winged Tanager, a stunning and very special bird. An equally impressive Emerald Tanager and close Slaty-capped Shrike-Vireo closed our mornings birding, and we returned to the coach for our picnic lunch. Settling down by a stream, lunch was punctuated with several excellent bird sightings. Lee picked up a couple Purple-throated Fruitcrows, and shortly after this David spotted a perched bird which turned out to be a Western White-tailed Trogon. Whilst watching this, a Chestnut-mandibled Toucan flew over and played hide-and-seek amongst the foliage on the hill above us. Then a small group of Dusky-faced Tanagers flew in right next to us. All this in between mouthfuls of an excellent picnic lunch! Afterwards, we tried to find a calling White-throated Crake which gave just brief flight views, but in the same area we saw Scarlet-browed Tanager, Blue-chested Hummingbird, and a Bright-rumped Attila. By now it was getting very warm, so we made the decision to go to Los Bancos, but unfortunately the approach road was impassable due to roadworks, so we headed into Mindo and stopped on a bridge over a fast flowing river. Some Yellow-throated Bush Tanagers showed briefly in the rain, whilst a Southern Nightingale Wren was very skulky and only showed to some of the group. From here it was a short drive to the hummingbird site at Los Coliebres and from the car park we saw Ecuadorian Thrush, Swallow Tanager, and a fantastic Golden-headed Quetzal. Taking shelter from the afternoon drizzle, we sat back and sipped coffee whilst watching all the activity at the feeders. The stunning White-necked Jacobin was quite common, whilst Green-crowned Woodnymph was possibly the most amazing and colourful hummer present. However Green-crowned and Fawn-breasted Brilliant, Andean Emerald, and Rufous-tailed Hummingbird kept us occupied, whilst a White-whiskered Hermit was really appreciated by all. The two scarcest hummers didn't show for a while, but a Brown Violetear became more frequent as time went on, whilst a rather spectacular Tawny-bellied Hermit appeared just once. So, once everyone was satisfied that they had caught up with all the spectacular hummers, photos had been taken, and coffee finished we returned to Septimo Paraiso for an excellent evening meal. everyone had great views of this superb little Choco endemic. Returning to the coach, a Sierran Elaenia was found. From here we returned to the bridge near Mindo, where Joan was the first to spot one of a pair of White-capped Dippers. After some time, one individual flew downriver towards us and fed right below, giving exceptional views. Nearby, and just as the sun set, a female Lyre-tailed Nightjar flew around the hillside in front of us before being scoped perched on a horizontal branch. Not a bad end to the day! Our pre-dawn attempt at finding the resident Mottled Owl failed, but we managed to come up trumps with some other goodies once the sun appeared over the edge of the valley. The sound of the forest coming to life was amazing, with Wattled Guan, Scaled Antpitta and Rufous-breasted Antthrush all calling from somewhere up in the impenetrable forest above. First of all, a Yellow-vented Woodpecker flew into the trees next to the swimming pool, whilst Southern Rough-winged and Blue-and-White Swallows, and White-collared Swifts flew overhead. Moving down to the bottom of the gardens, a rather quick moving flock zipped through the trees in front of us. Although a little frustrating, most of us managed views of nearly everything. GoldenTanagers were quite numerous, whilst a couple Metallic-green Tanagers were more elusive. With a little perseverance Black-capped Tanager was added to several life lists, as was Flame-faced Tanager, and a stunning Blue-winged Mountain-Tanager. A tall dead tree was host firstly to a Strong-billed Woodcreeper, and later to a group of Pale-mandibled Aracaris. Closer at hand, our only Tricoloured Brush-Finch put in an appearance, whilst a Smoky-brown Woodpecker was seen by some of the group. A calling Barred Forest-Falcon could not be enticed closer, whilst a dueting pair of Toucan Barbets remained hidden. After a hearty breakfast we loaded the bags onto the coach, before walking along the road a short way. 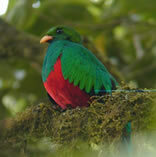 A Roadside Hawk and Masked Trogon were both seen, before a foraging Buff-frontedFoliage-Gleaner played hard to get. Overhead a soaring pale-phase Short-tailed Hawk was seen, before an unusually conspicuous Andean Solitaire put in an appearance. From here we drove along the old Nono-Mindo road towards Bellavista Lodge. A brief stop was made for a close roadside flock, containing several commoner species we had previously connected with, as well as a StreakedTuftedcheek that we scoped as it perched motionless on a mossy branch beneath a large bromeliad. A little perseverance paid off here with Montane Woodcreeper and Pearled Treerunner both being new for our ever growing life lists. Walking along the road produced a flock of perched Red-billed Parrots, as well as Speckled Hummingbird, White-sided Flowerpiercer, and Rufous-chested Tanager. Just before our picnic lunch, Juan showed us a Band-winged Nightjar at its nest right by the road, with a partially concealed chick just about visible underneath its breast feathers. Then everyone enjoyed a very close Plate-billed Mountain-Toucan before having yet another excellent picnic lunch. Once lunch was over, a side road was followed for a short distance, resulting in a really confiding pair of Yellow-bellied Chat-Tyrants who appeared next to us seemingly out of nowhere. Whilst enjoying these little beauties, a Rufous Spinetail appeared out of the tangle of bushes - again right in front of us. Unbelievably, the much sought after TanagerFinch popped up out of the dense foliage and we watched all three birds at incredibly close range for a good twenty minutes. Not believing our luck, we returned to the road and carried on walking downhill. Unfortunately a Toucan Barbet didn't stay in view very long, but we were more than compensated by an AndeanPygmy Owl that flew out in front of us and perched in a close tree. Other birds seen on the walk included Brown-capped Vireo, Blue-winged Mountain-Tanager, Crimson-mantled Woodpecker, and White-tailed Tyrannulet. At Bellavista Lodge, yet more hummers and coffee were enjoyed, and this time Gorgeted Sunangel, Green Violetear and Buff-tailed Coronet were the stars of the show. But all too soon we had to leave, and drove along the new road towards Quito. Juan came up trumps yet again when he saw a Giant Hummingbird from the coach. Everyone piled out, and after a few scary moments it appeared hovering near the road. Then another one appeared closer and we all watched it feeding and perched below us in a gulley. With a couple Ash-breasted Sierra-Finches scuttling around the floor on our return to the coach we were all ecstatic. A brief stop was made near the Equator monument before heading to Juan's house for a two night stay. Our last day's birding, so after breakfast we headed to the Yanacocha Reserve, situated close to Quito on the slopes of the Pichincha Volcano. The day was exceptionally clear, with blue skies and sunshine and the view was superb as we drove ever upwards, with the only bird of note being a Black-chested Buzzard-Eagle soaring almost at eye level. On arrival at Yanacocha we headed along the track that took us through superb forest. The first set of feeders at the entrance held GreatSapphirewing and Buff-winged Starfrontlet, both of which were common and easily observed this morning. New birds came quickly, with numerous Glossy Flowerpiercers soon being followed by our first Saphire-vented Puffleg, a single Rufous-naped Brushfinch, and an inquisitive Brown-backed Chat-Tyrant. The path carried on through the forest, with several open areas enabling good viewing. Just before one of these areas, a pair of White-browed Spinetails proved elusive at first before making their way right out into the open on some dead twigs. Nearby a couple Crowned Chat-Tyrants were equally skulking before giving themselves up easily and perching in full view. Whereas more new, and easily observed hummers were right in our faces on some trackside feeders, with Golden-breasted Puffleg and Tyrian Metaltail giving crippling views. Several times this morning an inquisitive Buff-winged Starftontlet flew straight at us and would hover literally inches away as if checking us out. However, the highlight for everyone this morning was the views of a much wanted bird, Sword-billed Hummingbird. At least two individuals were seen feeding and perched in nearby trees, giving the most excellent views. At the end of the track we sat down and watched the multitude of hummers feeding just a few yards away, but with nothing new we turned our attention to the surrounding trees. A flurry of activity was caused by a couple Pearled Treerunners, Superciliaried Hemispingus and White-bandedTyrannulet, whilst Variable Hawk and Brown-bellied Swallows were seen overhead. We waited quite a while in the hope of finding a feeding flock, and whilst here the cloud descended reducing visibility. So we moved on, trying to escape the attentions of the local midges. Almost immediately a White-throated Tyrannulet was seen, before Juan spotted a Scarlet-belliedMountain Tanager on the hillside above us. Unfortunately only some of the group got onto it before it dropped out of sight, but compensation for the unlucky came in the form of a pair of showy Rufous Wrens, and a cracking Barred Fruiteater was finally nailed after several near misses. With a flock of awesome Black-chested Mountain-Tanagers, Bar-bellied Woodpecker, AndeanGuan, and a couple truly stunning Golden-crowned Tanagers we finished our morning's birding in style. After a picnic lunch back at the entrance, we headed down to Quito to drop Julian off at the airport, before Juan gave us a brief tour of the old colonial city. On arrival at Juan's house, there was still a little daylight so everyone was very keen to see what his huge garden had to offer. It didn't take us long to see a stunning Vermillion Flycatcher, whilst Western Emerald, Cinereous Conebill, Hooded Siskin, Ash-breasted Sierra-Finch, Rusty Flowerpiercer and Black Phoebe were nearly all new additions to our trip list. A very early breakfast was taken before driving the short distance to Quito Airport, where we said our farewells to Juan. He had been a superb guide, and had worked extremely hard in finding many rare and beautiful new birds for us all. So, an uneventful journey back home was punctuated with a brief stop at Bonaire in the Dutch Antilles, and a changeover in Amsterdam before eventually reaching London's Heathrow Airport on Saturday morning. On behalf of Juan and myself, I would like to take this opportunity to thank the entire group for making this tour such a pleasure to lead. 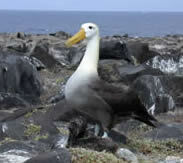 This was, without doubt, our best ever tour to the fabled Galapagos Islands. The group were really fantastic and enjoyed every second of their holiday, participating in all excursions, snorkelling with all sorts of wildlife and generally thoroughly enjoying themselves. Our short stay on the mainland was incredible, and really added an extra dimension, with many people commenting that they had two trips in one! I thank you all for making it so enjoyable.